ASHTABULA - Last Sunday, Nov. 11, Framed on Main, 4533 Main Avenue, held a reception featuring artist Micheline Guerriero. Guerriero is an Ashtabula native. As a child, she focused on music and performance. After enrolling in art classes at Harbor High School, she decided that she was more passionate about the visual arts. She attended Kent State University where she earned her Bachelor’s of Art in Art Education, 2005, and a Master’s of Science in Educational Media and Digital Design from Full Sail University, 2009. She is now a full-time working artist. The theme of Guerriero’s work is Metamorphosis Goddess. Her show was sponsored by the Chalk Box. “My work speaks of the many roles in life. On one side is maternity and Mother Earth and the other deals with horoscopes and mythology. I am a Capricorn, so I deal with fish, land and water and underwater landscapes,” said Guerriero. During the reception at Framed on Main, a steady crowd of art enthusiasts and fellow artists filled the studio area to meet the artist and enjoy refreshments provided by Dublin Down. Chris DiGiacomo, owner of Framed on Main, tries to feature local artists throughout the year and introduce the various forms of talent in the area. On display were melted bottles, ceramics, belt weaving and hanging works of art. Her work is greatly influenced by personal experiences with nature. She expresses her outdoor experiences through various art mediums. Guerriero owns the Lake Erie Mermaid Arts Studio, located at 1317 Bridge Street in the Ashtabula Harbor. She teaches and gives art demonstrations and workshops. She is also an art teacher for Madison Middle Schools. Lake Erie Mermaid Arts Studio is her private work studio, but it also functions as a revolving display gallery, public art event and private party space. 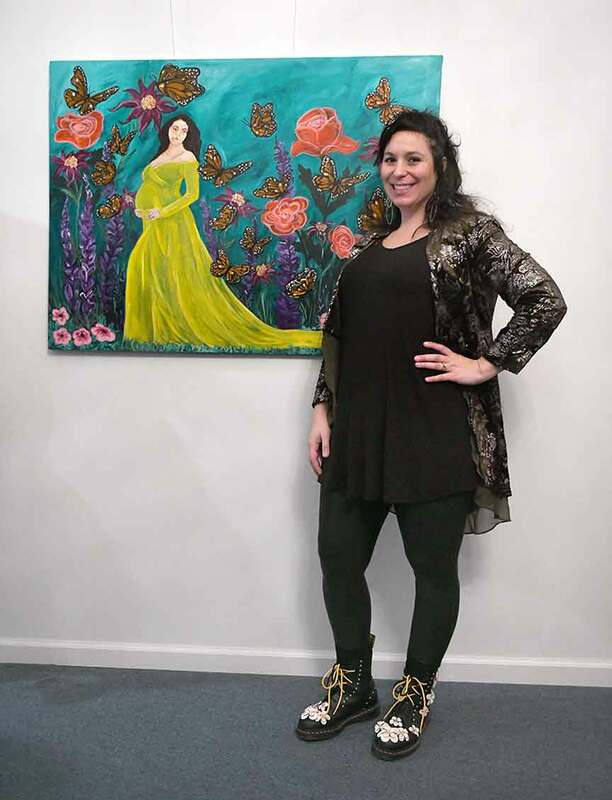 Micheline Guerriero poses beside her painting, a partial self portrait.